Hmmmmmm. Neo Cafe Racer. Honda has apparently created a whole new genre of motorcycles. Nope. Honda has taken the CBR300 engine, put it into a new naked street bike and painted it in trendy flat colours, some polished alloy and then sent it to be sold. My own arty farty over-exposed image. Bad camera work, not art. Oh don't get me wrong, it's a nice looking bike. It hints and suggests cafe racer perhaps but it barely resembles what I understand to be the cafe racer style. The original cafe racers were motorcycles altered to be fast between cafes, stripped down, lightened and adapted for short fast runs. Luxuries such as luggage and comfort were of no consequence. What came about was a minimalist sporty style but without fairings. How does the CB300R match this ethos? Well it is light, that's for sure. At 143kg kerb weight it is lighter than Kawasaki's "Super Light" Z250SL at 148kg (and that's without ABS unlike the CB300R). Comparing it to the MT03 (168kg) it's likely to blow away in a stiff breeze. Stripped down? It's hard for a manufacturer to strip a bike down as it has to meet regulations. That said there is only that which is required, seat, engine, lights, you get the idea. There's no luggage space, there aren't even any handy hooks for bungees. Hell there aren't even any proper grab rails for a passenger. I does have a pillion seat and footrests, I'm not sure why though. There's not a lot at the back save for the sticky out bit required by law. There's nothing unnecessary up front either. Sporty? There's no clip ons or drop bars but the bars are almost flat. It has a more modern seating position that pushes and pulls the rider further forward over the tank. Personally I like it, I feel like the front end is mine and I'm on top of it, the rear can do what it wants. Performance numbers matter to some people, particularly young people who are the more likely candidates to purchase this bike. At 31bhp it's not as powerful as the MT03 (41bhp) but it has a bit more than the Z250SL (28bhp). That said at 27.5 Nm of torque compared to the Yamaha's 29.6 Nm it's got some grunt. You can look at figures all day long, that won't tell you what it actually feels like to ride. The Z300/MT03 models feel like big bikes made small, this feels like a large 125 or a small 250 and less like a "big bike" save for a fairly tall seat. Everything comes to hand just as it should and I'm used to the upside-down indicator horn arrangement because it's the same as my 500. Upside down forks, radially mounted brakes, ABS. Oh and a reflector. With the flat bars I'm positioned with just a little weight onto my wrists, not sporty nor sit-up-and-beg. It's the same with the pegs, neutral position. There's a little more padding on the seat than some modern machines but eeeeehh it's not like the old days. I'll see how comfortable it is over the next hour. It starts immediately, like all modern bikes. The levers are light and unobtrusive which means they're how they should be. The first half mile is unsurprising. No, no no, that's a good thing! Every day I brush my teeth yet I don't notice my toothbrush. That means it works, it does what it was meant to do. You only notice a boiler when there's no hot water, you only notice a cup when it breaks. I notice very little about the CB300R which means everything is normal, natural, working as it should be, right and correct. It's hard to make LED lights look vintage despite the round case. Through the suburbs the motor is strumming happily and the balance is excellent. With only 47 miles on the clock I'm wary about throwing the bike into a corner as the tyres aren't even scrubbed in properly yet. Once again everything neutral, natural and easy. Eventually I reach the countryside. Luckily there's some great roads not too far from Wigan so now's my chance to see what this bike is made of. The power initially is flat. Then I let the revs rise and whoa! There it is, that's what I was looking for. The motor is the same as the CBR300 and that's derived from the off road CRF250L. I recall the CRF had punch all around, here the road based 300 needs a few revs to start breathing properly. But when it does breathe it breathes very well with a smile inducing shove forwards. Sweet. An established and developed motor means it ought to be reliable. The light weight, the neutral position, the tyres and the balance soon see me whizzing through the scenery with aplomb. It's a hoot to ride! Sure footed and flickable, precise and undaunting, I'm grinning within my helmet. It takes a few corners to suss how the bike likes to be pushed into the bend then we're off. It truly does feel like a meaty 125 with that extra power a 125 can lack. Going up a steep hill rather than having to will the bike to go faster the 300 engine has sufficient power to maintain the speed limit with a little in reserve. It does not have the excess of power that means you can be lazy through a bend and make it up on acceleration later. It demands to be ridden and it revels in being ridden hard through the twisties. No rising rate linkage - YAY! Comfort wise it is acceptable. There's a little more weight on my wrist than I'm personally used to but it's nothing. It's fine, and that for the cafe racer purist is probably a bad thing. Back in town on my way back to the shop I calm everything down and relax back into everyday riding mode. It's back to feeling like a chunky 125 being easy to plod along and doing what it does so well I've stopped noticing again. My thoughts are about what this bike is all about and what it means to myself. It's great, it's fun and completely impractical. At legal speeds there's plenty of power without getting into the ridiculous excesses of bigger machines. It handles very well, the light weight makes it so manageable. It's a proper hooligan machine if you want it to be so long as you're not breaking the legal limits. It can also be polite and kind and relaxing if the mood or the road requires it. 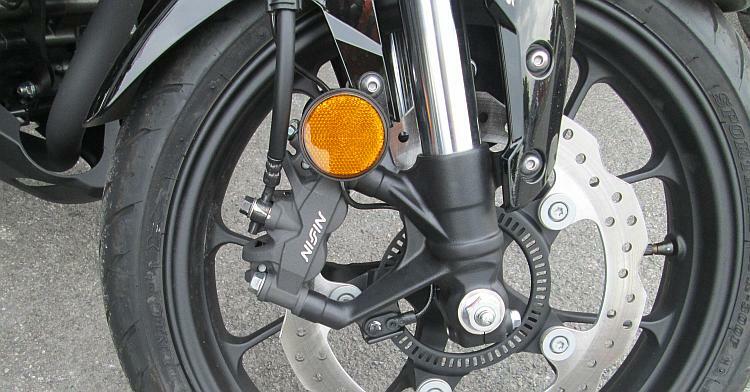 There are pros with the CB300R, and there are cons. This bike was never intended to carry anything other than a rider. For myself this is a deal breaker. Where would the tent go, the panniers, the tank bag and the top box? Tank bag? Yeah the tank has a plastic panel over it rendering mag-bags out, you'd need a filler ring setup. The exhaust appears to be mild steel. In this day and age this is unacceptable, even the budget Enfields come with stainless. Come on Honda, pull your socks up. Being more like a powerful 125 than a big bike with a smaller engine the CB300R could have been ideal for smaller riders. Regrettably Honda gave it a (relatively) huge seat height and that ended that. CB300R "Low" Honda - come on! Trick upside-down forks look nice and appear to work very well. Bear in mind there's no adjustment though. 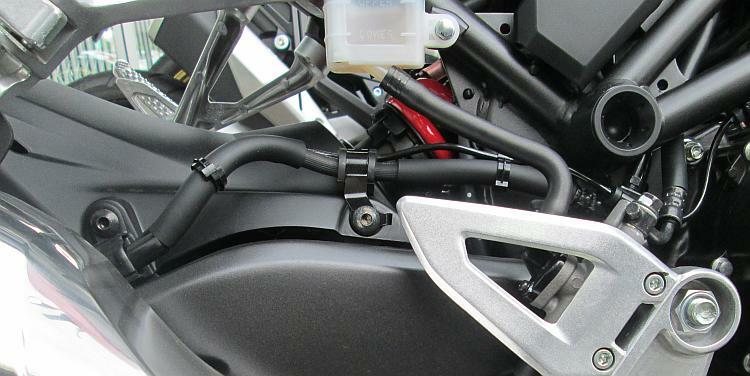 The rear shock bolts straight to the swingarm. This is a GOOD thing! Rising rate linkages are a waste of time for normal human riders. Without it there's less to go wrong and less weight. Trick tangentially mounted front brake. To be honest it probably doesn't make much difference at this level but it looks good and is in keeping with modern times. 8,000 mile service interval. It makes a big difference to the overall cost of ownership, something that is often overlooked. Fuel Economy. I personally would expect 90mpg out of this bike in everyday use and with gentle countryside pottering around over 100mpg. The CBR300 has a good reputation with fuel and this should be no different. Trick indicators. 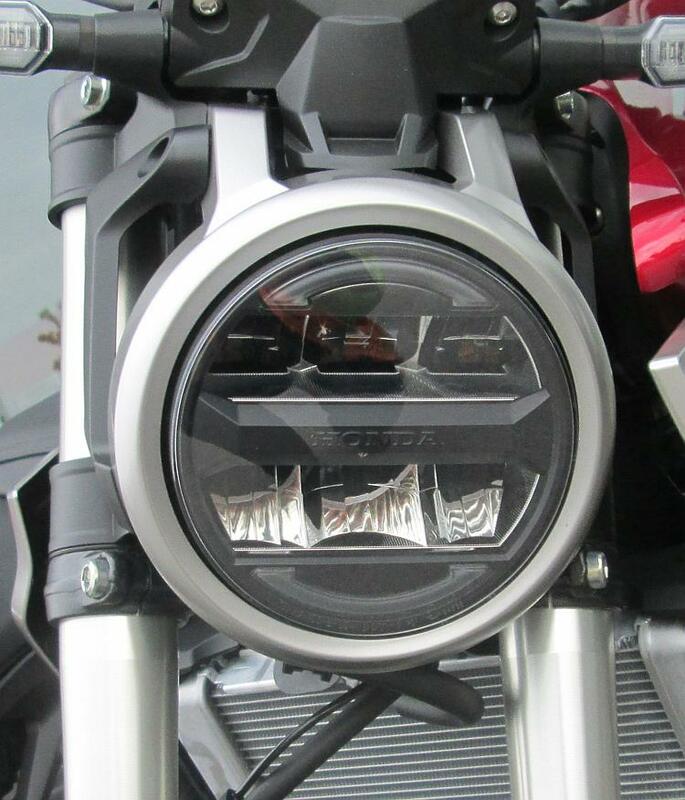 The indicators stay ON while you ride then flash when indicating. It's rather American and I'm afraid to admit I like this. Honda might argue as this is a new genre then there is no competition. Erm, OK. In the real world it's up against the MT03, the Z250SL and the Z300 (although the Z300 is not presently listed on the Kwak site's main choices). Suzuki don't have a naked 250-300cc machine listed at present. 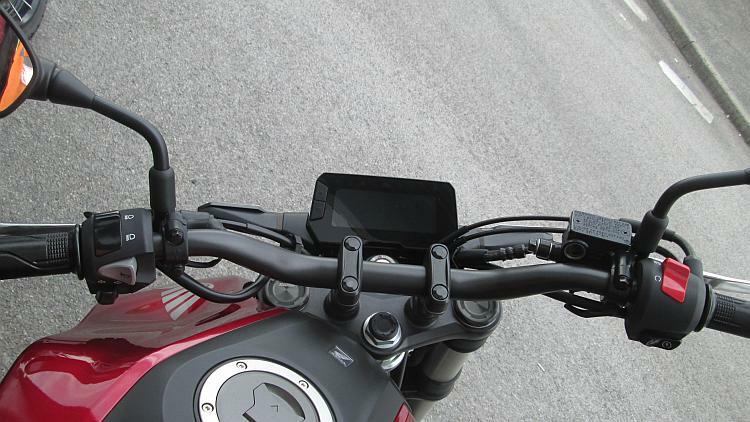 The MT03 and Z300 being twins have the upper hand on power. IF numbers matter then that's that. IF you're looking at the rider experience then the CB300R competes by being lighter, more agile and more akin to a 125 with pazzaz rather than a big bike with a smaller engine. 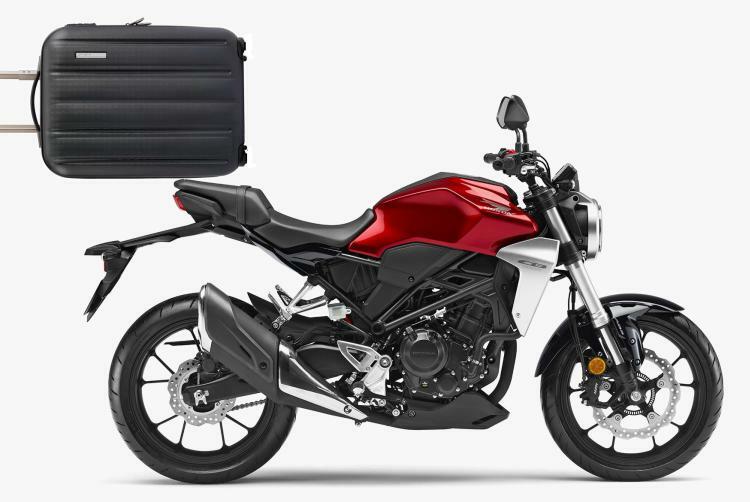 Comparing the Z250SL and the CB300R is much closer. Both are small and light with similar power. 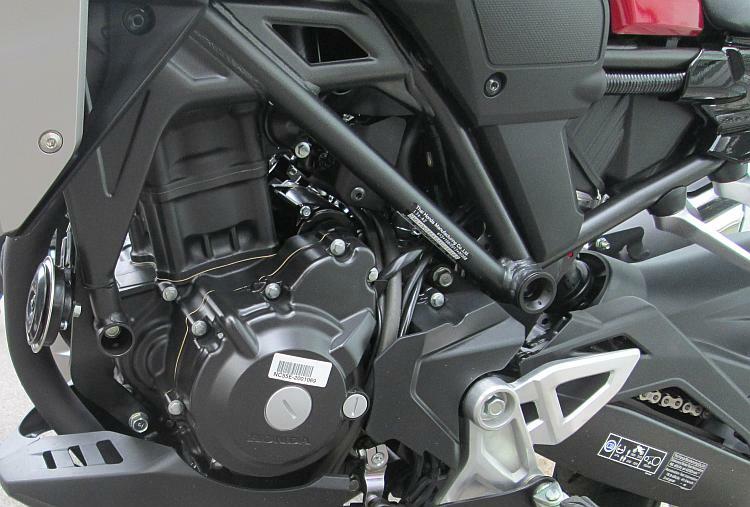 The Z250SL has a sharper and more punchy bottom end while the CB300R has the top end go beyond the Kwakker. I personally think it will be the looks that sell this bike to younger riders. If you're a sports bike fan then you'll get a sports bike, easy riders will buy cruisers and so on. I have zero sense of fashion but I'm sure there'll be some "yoofs" who don't want to follow the prescribed options so will take a shine to a new twist. I've been made aware that many of the smaller capacity models are selling to mature riders looking to downsize. So long as this person is tall enough for the saddle the CB300R will be a great choice. It's so light and manageable without losing motorway power and grin factor acceleration. The CB300R is a fabulous toy. Just like a cafe racer it's totally impractical and a whole heap of fun to ride. Unlike the old cafe racers it should be reliable and economical too. Would I buy one? No, it's a toy, a great toy but a toy never-the-less. I need my luggage maaaaan. Just want to say thanks for this, though you missed an important point to any bike review - how fast can it lap a Spanish test track?? Ah Snod. Regrettably here at Bikes And Travels Towers (bit like Fawlty Towers) we have not yet managed to blag our way onto the motorcycle journalist test circuit. I can only imagine this is an oversight on behalf of Honda, Kawasaki, Triumph et al. I am eagerly awaiting my invitation to go on an all expenses paid sojourn to a hot country with a test track to test out the new Honda Cub when it is released. In the meantime I shall continue to thrash poor unsuspecting and not even run in small capacity motorcycles around the back lanes of Parbold and Wrightington. I am, as they say, "waiting to be discovered". Pricey? Definitely compared to a C90 although those things are becoming ever more popular and pricey today. Kawasaki's new Z125 is something like 4 grand and a bit more. How the devil they're selling these things when the Chinese 125s are half the price and ever improving on their quality is beyond me. Sharon's Z250SL is absolutely fabulous value at 3 grand brand new. Not many left now though. Its a shame Honda didnt fit that 300 engine in the CRF250M. It's an interesting observation Keith m. Here in blighty that extra few horses might help with sales. I suspect it may be to do with the rest of the world and their various licence laws, it may be something to do with the MX market or it may be Honda has a shed load of 250 engines they need to shift. These things will remain a mystery to we mere mortals. I merely on and handled the 300 recently whilst killing time waiting for a service for my Keeway RKV 125 commute hack... With the topbox I am sold! it felt lighter than my (very) old Honda Ns125F! Just the small matter of the cost of the theory, and practical tests stand in my way - alas.